Weasel's Journey: Update on Vivian. Vivian's procedure went very well this morning. She threw quite a fit getting into the car and then did not want to get out once we arrived at the hospital. Her antics had the up side of wearing her out, however, and she fell asleep before the anesthesiologist even arrived. Here she is snuggling with her beloved 'Baby Dumbo' and stuffed dog Sam. After about 45 minutes, the nurse paged me to join Vivian in recovery. She was chatting up a storm and enjoying a popsicle! She's not wild about the splint on her nose, but otherwise she's doing great. 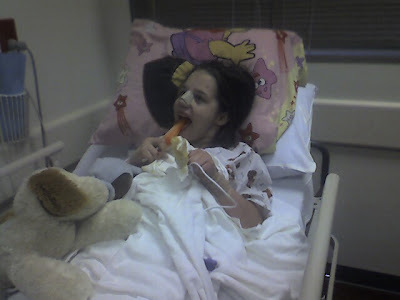 I stumbled onto your blog and was so touched by these pics of you little girl. Hope she's doing well, and I love her name!